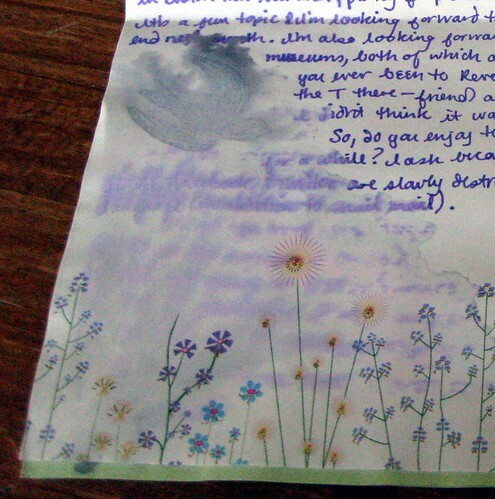 The Missive Maven: The amazing waterlogged letter, which actually arrived! 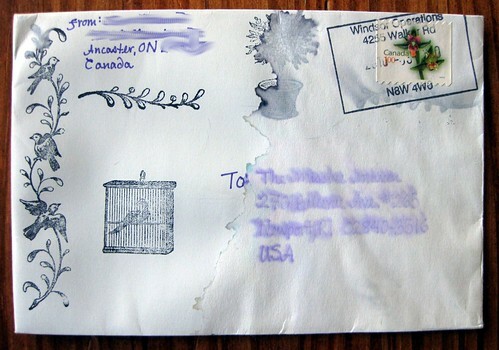 The amazing waterlogged letter, which actually arrived! I was so very surprised when I pulled this out of my mailbox - amazed that it actually arrived! The water damaged must have happened to this one en route, not caused by me. You can make out the address if you look reeeeeeeally closely at it. I wonder if this ink had some kind of a waterproof component to it? ... and the letter was all blurred into itself on the wet side. Wow! I would NOT expect that to arrive. It's really too bad that the letter was partly smeared. Uh-Oh! well at least it did make it to you! I hope the insides were readable. Now I wonder... 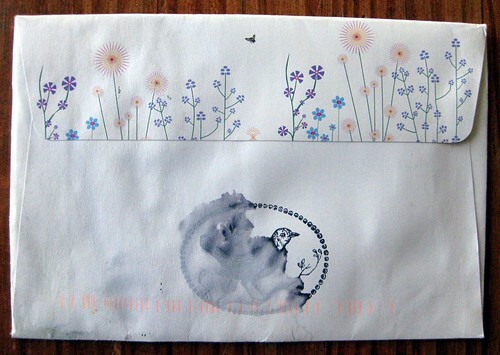 I sent you a mailart envie with a little goodie inside. The envie was made from a paper bag they use to wrap wine at the grocer. I worried a little when I mailed it that it might have been to frail to make it through the mail. Did it make it to your mailbox? If not I will send something else to thank you for the POB warming post card : ) See you in the mail! Melody - it's pretty stationery! I admired it, even smudged. Elle - Yes, your item arrived. It is in Ye Olde Pile, awaiting a response... But it arrived fully intact. oh my gosh that is terrible but hey it made it that in itself is a miracle . It probably got scanned before it got wet, after that it isn't the address that it used to deliver it, but the barcode you see printed on the back. I imagine the drivers that deliver the last leg probably have a handheld scanner they can check with as well, probably the same one they use for packages that have tracking. With all their faults, the USPS does a pretty amazing job considering. M, I totally agree about the amazing job the USPS does overall! What a shame about the water damage, but two thumbs up to the USPS for getting that thing properly delivered! Bahhh!!!!! 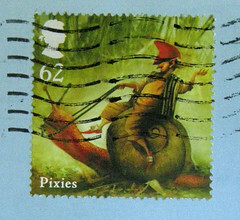 (that's mine) Do you know how hard I worked to put those stamps on there? LOL well I hope you enjoyed it anyway. I actually took photos before I sent it because it looked so nice! Oh my gosh, Eliza, if I had ever made the connection between your blogger persona and your real one in letters, I had forgotten it. Sheesh! I just wrote you a letter last night, after I realized I'd broken one of my own cardinal rules and blogged about a letter before responding to it! A little late to the party . . . I always worry about my address info getting smeared. Saw a helpful tip online about rubbing a little beeswax or white candle was over the address after it's dry. It protects the ink/typescript from moisture but isn't too thick to interfere with the postal machinery. I have a beeswax bear candle someone gave me years ago that I use for this. The Very Special Giveaway will travel to Finland!